Large stoneware ginger beer bottle. It has a brown glazed neck and a cream body. Pottery screw top lid, with metal handle, corked bung at base. The bottle holds 2 gallons and is intended only for advertising purposes. It is incised on the bottom: Doulton Limited, Lambeth, and has a black transfer on the front: A.N. Gibbons, Fitzherbert St, Palmerston North. 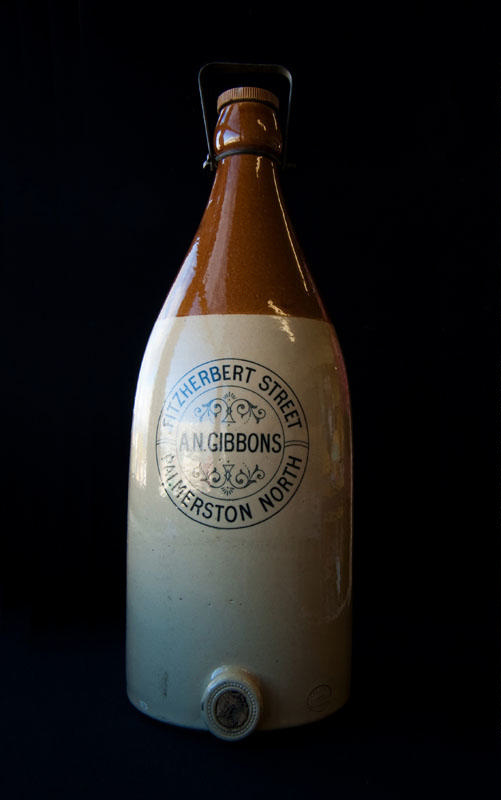 This is the only bottle of its kind known to exist.It appears to have been made as an advertising item by Royal Doulton in England. Alfred N. Gibbons puchased the aerated water and cordial business in March 1902 from Mr Beck of Palmerston North. He ran it until December 1903 when he disposed of it to Mr E.S Dixon 18 months later.